Anyone can learn to become a valuable mentor to someone with less experience. By establishing yourself as a positive role model, you can have a rewarding impact on your mentee's career. 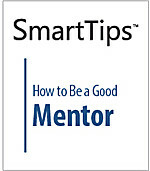 This SmartTips video offers five steps to structure this mutually beneficial relationship.